Each February, National Alfalfa & Forage Alliance members travel to Washington, D.C. to participate in NAFA's annual D.C. Fly-In where they meet with lawmakers to discuss issues related to alfalfa and alfalfa forage systems. Typically, NAFA meets with staff of House and Senate Ag Committee members, House and Senate Ag Appropriations Committees members, USDA, and other agencies as necessary. NAFA representatives may attend more than 100 meetings scheduled over the course of the 4-day event to promote NAFA objectives, educate Congressional members on the issues important to the alfalfa industry, and continue to build awareness and recognition of the nation's 3rd most value crop. 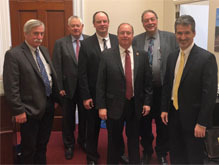 (L to R): NAFA Directors Doug Walsh, Mark Wagoner, NAFA Fly-In participant Scott Duffner, Congressman Jim Hagedorn (R-MN), NAFA Fly-In participant Randy Welch, NAFA Associate Director Jon Dockter. 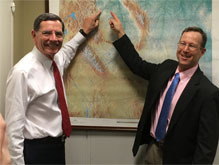 Senator John Barrasso (L) (R-WY) and NAFA Director Morgan Grover. 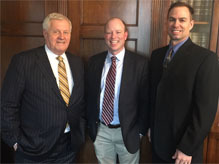 (L to R) Chairman of the House Agriculture Committee Collin Peterson (D-MN), NAFA Fly-In participant David Yost, NAFA Director Shawn Barnett. 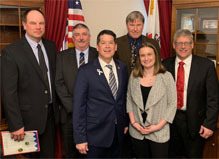 (L to R) NAFA Fly-In participant Scott Duffner, NAFA Director Ron Cornish, Congressman TJ Cox (D-CA), NAFA Director Dan Putnam, NAFA Communication Director Chelsea Russell, NAFA Director Mike Lauwers. Senator John Hoeven (L) (R-ND) and NAFA Fly-In participant Ben Kuhn. Senator Jerry Moran (L) (R-KS) and NAFA Director Darrin Unruh. 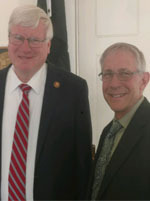 Congressman Glenn Grothman (L) (R-WI) and NAFA Director John Ruedinger.